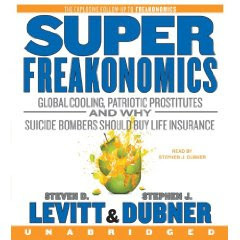 I just finished the audiobook version of Superfreakonomics and I enjoyed it. The authors include Steven Levitt, the famed prodigy economist at the Univeristy of Chicago. I also enjoyed their previous book, Freakonomics. They present micro and behavioral economics as it appears in everyday modern life. And they do it in language that anyone can understand. Walking drunk is much more deadly than driving drunk. How pimps are like Realtors. Why suicide bombers should buy life insurance. How Iran uses incentives, and not altruism, to get kidney donors. Children who watch a lot of TV are more likely to engage in crime when they get older. The profit motive encourages doctors to administer chemotherapy, even though it's not effective in saving more lives. The Endangered Species Act has perverse incentives for landowners, causing them to clear habitat. Buying locally produced food increases greenhouse-gas emissions. You're more likely to solve global warming by throwing sulfur dioxide into the air than through any incentives Al Gore has in mind for getting people to use less energy. Monkeys can learn the value of money. Why are doctors so bad at washing their hands? Childrens car seats aren't quite as effective as we think. There are plenty of negative reviews online. That is to be expected since the authors tackle some relatively sacred cows. Regardless, the book was interesting and kept my attention during long drives. It was interesting enough to make me google several included topics afterward to learn more. I recommend this book.